Find Free 3D Models on TF3DM.com | Site of the Day | All Free Web Resources for Designer - Web Design Hot! 3D printers are today creating a revolution in the rapid prototyping industry. Rapid prototyping technology utilizes computer assisted design software incorporated into 3D printers which allow companies to create 3D Models during all phases of the product development process. The prototypes created by the 3D printers can then be used by marketing agencies to incorporate further enhancements and improvements into the designs. 3D printers used for rapid prototyping technology are able to produce models quicker, easier and more cost efficient then traditional model making techniques. The tremendous application potential for 3D printers and rapid prototyping technology is just beginning to be realized and will continue to play an important role in designing and creating 3D models for decades to come. 3D Printers used for 3D Models. 3D model is a computer simulated wireframe demonstration of an object. You will need a computer and some software to make a 3D model. You can then output your 3D model by rendering it. A process that allows you to create a flat image of the model with textures and lighting added to the model. You can also output the model to a 3D printer that can laser cut the shape. On the other hand, you can output a fly-through . You will need a 3D engine to present the object in a virtual world. If you need 3D models to help you get started you can view TF3DM.com where you can download free 3d models that other people have made. 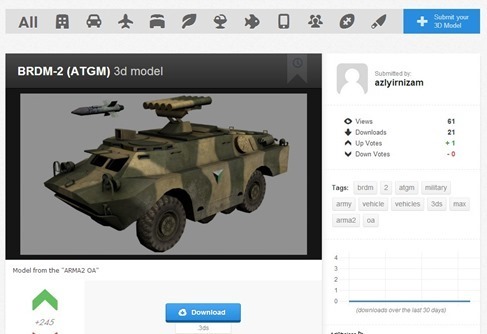 Tf3dm.com is one of the most popular free 3d models websites. The website is a free exchange website for all different formats of 3d models. The web is a wonderful thing. It’s full of endless resources and tutorials for people wanting to learning the art of 3ds Max. 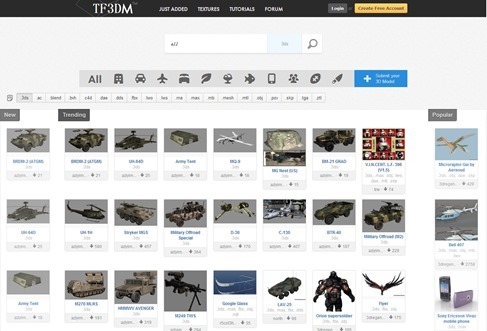 TF3DM.com web design is very convenient and practical.You can easily find the model you want and can also search by keyword search box to find the model, for example, enter “3d tree” you can see all the trees of the model. When you find the model, you can download it, then open it with the appropriate software.This site focuses on 3ds models format, you can edit them using 3D MAX software.This is a common, industry-standard 3d modeling software for 3d modeling work. Anyone can contribute their models to the website. If you’ve made something you’re proud of, you have products to sell, or you’d like to advertise your modeling services by posting examples of your work, this is where to do it. This entry was posted on Thursday, May 9th, 2013 at 3:12 am and is filed under Site of the Day . You can follow any responses to this entry through the RSS 2.0 feed. You can leave a response, or trackback from your own site.